Since 1985, we've hooked thousands of kids on Stand Up Paddling (SUP), windsurfing, sailing, kayaking and many of them return to our camp year after year! So, if you know of any kids age 9 to 16, who might love water sports the way you love water sports, hook them up with us and we'll introduce them to some of the greatest experiences of their childhood! 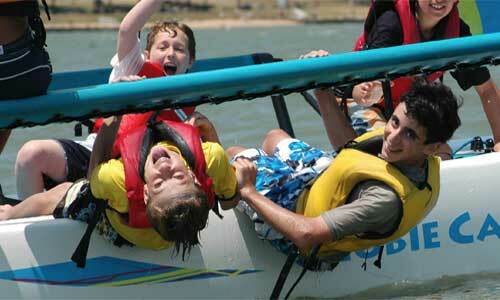 Our Watersports Kids Summer Camps begin on June 19th this year, and it's not too late to sign up! These camps run Monday thru Friday and kids can sign up for as little as one week or as many as all 10 weeks. An introduction to the fun and exciting world of fun on the water with the best water sports team on the Chesapeake Bay! Nationally certified instructors will guide campers through a challenge-by-choice experience on the clean and beautiful waters of the upper Chesapeake. This week-long camp offers a variety of water sports including Stand-Up Paddleboarding (SUP), Kayak Challenges, Paddling Adventure Tours, a Hobie Cat Sailing Experience, Water Trampoline, Swimming, Team Building, and Boating Safety. Experience the most outrageous fun you'll have all summer at one of the finest water sports facilities in the country! Nationally certified instructors will train and challenge campers on the pristine waters of the Chesapeake Bay. All water, all wet, all the time. The week-long camp experience includes many exciting sports and activities including Stand-Up Paddleboarding (SUP), Windsurfing, Kayak Challenges, Hobie Cat Sailing, Water Trampoline, Water Volleyball, Swimming, Team Building, and Boating Safety.